A second floor brand new 1 bedroom apartment located within a private gated development in the heart of Iver. Complimentary Taxi service to the train station morning and evening and bikes provided. Universal House is situated in the heart of Iver village, in the South Bucks district of Buckinghamshire, on the outskirts of London. The Haywood's Group are stripping back and converting this former commercial building and creating 17 brand new luxury apartments, carefully complimenting the highest quality finish within the stylish architectural features of the original building. Set back from the High Street with secure gating, the development offers private parking for all residents. The stunning selection of one and two bedroom apartments are set over three floors and will appeal to first time buyers, young professionals and investors due to their proximity to an array of local amenities including a newly opened Costa coffee and Co - op supermarket, as well as Iver train station which is approximately 1 mile away. Cross rail is anticipated to join Iver in 2019 and will vastly reduce the commute time into Paddington, London. Each apartment will be finished with stone work surfaces, CDA appliances, induction hobs, video entry system, oak engineered wood flooring, luxury carpets, designer tiles and double glazing. All properties will be sold with a 10 year new build warranty, are help to buy registered and are offered with a discounted conveyancing fee. Completion of Universal House is set for Summer 2018 and all apartments will be available with a 125 year lease. Apartment 15 is a one bedroom second floor apartment at 523 square ft, which includes an entrance hall, open plan living room/kitchen, double bedroom and bathroom. The bathroom offers designer tiling and fittings with LED mirror cabinets. Iver is popular for its tranquillity whilst being easily accessible via road, with quick access to the M40, M25, M4 and A40, train line into London and pending Cross rail connections, as well as proximity to all London airports, in particular Heathrow which is approximately 7 miles away. Iver has an array of popular country pubs, a community green and some beautiful countryside with Black Park, Langley Park and Thorney Park Golf Course all close by. For those with children, Iver has a selection of good Infant and Junior schools as well as some highly sought after Grammar schools. 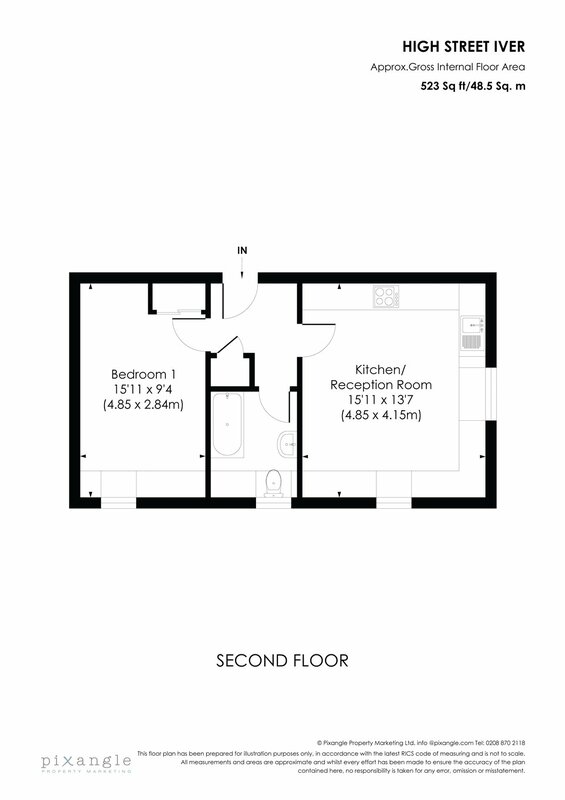 Please note the furniture and fittings shown in the floorplans and internal photos are for illustration purposes only and are not included in the sale.